Some of you might know the Canadian high-end audio manufacturer Bryston. 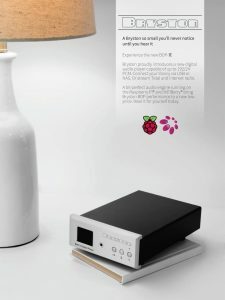 They just announced their new digital player, the BDP-π, and as you can guess from its name, it’s based on the Raspberry Pi. We’re proud we could contribute to this product by doing what we do best: making Raspberry Pis sound great. The BDP-π’s output stage is based on our Digi+. You should see the Bryston BDP-π in a few weeks in stores. Already this weekend you can see it at Bryston’s booth at Salon Audio / Audio Fest in Montreal. On Friday you might run into one of us there as well!